Senate Minority Leader Chuck Schumer called Trump's trip a "flop"
President Donald Trump declared his first Asian tour "tremendously successful" as he hopped on a plane bound for Washington. But when he landed at the White House late Tuesday he arrived with few concrete accomplishments in hand. As he jetted across the region, to five nations, six cities and three summits over 12 days, Trump pushed regional leaders to reshape trade deals to America's liking, but he won no firm commitments from his hosts. He opened the door to negotiations with North Korea, but then seemed to shut it again by deriding the dictator Kim Jong Un as "short and fat." He did not try to push leaders to end human rights abuses. Trump has said he'll have more to say about the trip's achievements in a "major statement" at the White House this week. The White House would not discuss the details in advance. The trip did reveal much about Trump's traveling style. He soaked up the pageantry and was well practiced at the art of flattery. For all his tough campaign talk on trade, Trump appeared reluctant to take a confrontational stance. He cajoled and flattered leaders in Tokyo and Seoul without eliciting firm commitments for a more balanced economic relationship. At a summit in Vietnam, he vowed to hold rising superpower China accountable for unfair business and trade practices. Yet in Beijing, the president said, "I don't blame China" for a growing trade gap. In the White House view, Trump accomplished what he set out to do: strengthen relationships with world leaders and lay the groundwork for more equitable trading deals. "I think the fruits of our labor are going to be incredible, whether it's the security of our nations, whether it's security of the world or whether it's trade," Trump said before leaving the Philippines on Tuesday bound for home. But across the Pacific, Trump was reminded of the challenges that were awaiting him in Washington. "Who is Roy Moore?" Xi asked. That moment, described by two White House officials who weren't authorized to speak publicly about private conversations, underscores Trump's domestic challenges. He must grapple with the uncertain fate of his tax cut plan, face the threat of a government shutdown and decide whether to cut ties with Moore, the Republican candidate in Alabama's special Senate race, who is accused of sexually assaulting underage girls decades ago. For most of the trip, Trump was able to leave domestic affairs behind, though he did reignite the Russia firestorm by revealing that President Vladimir Putin had insisted to him in Vietnam that Moscow didn't hack the 2016 election. Trump added: "And I believe — I really believe — that when he tells me that, he means it." Trump later clarified that he was "with" the U.S. intelligence agencies that concluded Russia was behind the interference. In Seoul, Trump delivered a sharp warning to North Korea, saying: "Do not underestimate us. And do not try us." But he also, for the first time, signaled a willingness to negotiate with Kim, though he didn't elaborate. Just as vital as the message Trump delivered to Pyongyang was the one he sent to China, which supplies most of North Korea's economic lifeblood. His message to Beijing: It's time to do more. At each stop on his trip, Trump both bemoaned the current state of U.S. trade relations in the region and announced new business deals, including more than $250 billion in China. But most of those agreements were older, already agreed-upon or only promises. 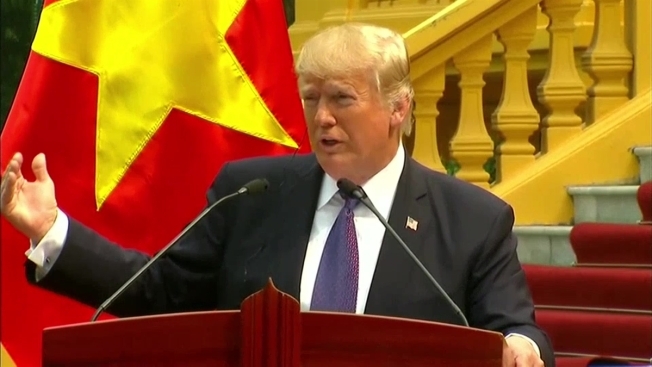 In Vietnam, he scolded China for unfair trade practices and delivered a forceful advocacy for bilateral trade deals, only to have 11 nations strike a multinational agreement hours later. Breaking with previous presidents, Trump largely abandoned publicly pressing foreign leaders on human rights. 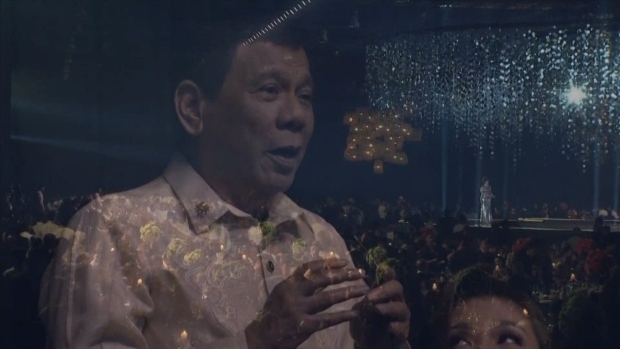 He said nothing about restrictions on civil liberties or press freedoms in China and Vietnam and, most notably, did not rebuke Philippine President Rodrigo Duterte for overseeing a violent drug war that includes extrajudicial killings. Senate Minority Leader Chuck Schumer called Trump's trip a "flop." "He seemed far more interested in pomp and circumstance — red carpets, fancy meals, and the flattery of foreign leaders — than advancing American interests in a region that is increasingly looking to China for leadership," said Schumer, D-N.Y. "And after the president's performance, those countries are going to turn more to China. At least they have strength and direction, even though China will take advantage of them for sure as they have taken advantage of us." Ever the showman, Trump reveled in the imagery of the trip, including a private tour at sunset of Beijing's Forbidden City, golf with Japanese Prime Minister Shinzo Abe and lavish state dinners. But he was denied the dramatic moment he desired. Trump planned a secret visit to the demilitarized zone at the heavily fortified Korean border. But with Marine One just five minutes away, heavy fog forced his helicopter to turn around.